Over 100 attendees at Saturday’s meeting of Northern California Chapter of the National Speakers Association heard the benefits of taking a Hollywood approach to writing and delivering presentations in order to elicit emotion in an audience. Hall of Fame keynote speaker and executive speech coach Patricia Fripp joined forces with Hollywood story expert (and Will Smith’s script consultant) Michael Hauge. Fripp is the founder of our Chapter and a leading authority in the world of professional speaking. Hauge is a story and script consultant, author and lecturer who works with writers and filmmakers on their screenplays, novels, movies and television projects. He has coached writers, producers, stars and directors on projects for Will Smith, Julia Roberts, Jennifer Lopez, Kirsten Dunst, Charlize Theron and Morgan Freeman, as well as for every major studio and network. 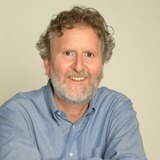 Michael also works extensively with Hollywood executives, producers, agents and managers, helping them sharpen their story and development skills, and improving their companies’ abilities to recognize powerful material, employ advanced principles of structure, character arc and theme, skillfully communicate a story’s strengths and weaknesses, and work effectively with writers to achieve a commercially successful screenplay. His skills and experience were immediately applicable to the professional speakers and speechwriters in the room on Saturday. Fripp introduced the program by saying it is difficult to be creative in isolation, hence the collaboration between her and Michael that enables their creativity to flourish. She stated that to ensure your audience remembers your presentation you must present information in a way that it connects with them by following a basic story outline formula: When? Where? Who? What Happened? A Hero. The story must have a hero or heroine. This main character drives the story and has the potential to be heroic. The hero’s desire propels the action. Create sympathy. Make them the victim of an undeserved event. Put the hero in jeopardy. In Raiders of the Lost Ark Indiana Jones escapes a host of threats at the start of the movie that have nothing to do with the rest of the plot, but develop empathy for Jones. Make the character likeable, kind, good-hearted, generous. Opportunity. When something happens that has never happened before and gets the story moving. New Situation. To allow the hero to pursue a visible goal they want to accomplish. Outer motivation. Or the visible goal that the hero wants to accomplish by the end of the story. This goal must be within the hero’s power to accomplish. As a story coach, Hauge asks “What’s this story about?” In the movie, Gravity, the heroine’s goal was, “I want to get home.” This outer motivation should be easily expressed in a single sentence. The clearer you can be about the visible goal of the hero, the better. Growing Conflict. A great story provides obstacles for the hero to overcome. To elicit emotion, you must amplify conflict. Whatever goal the hero wants to accomplish, you must convince the reader it’s impossible and then find a way to achieve it. Climax. At this point of the story the hero confronts the biggest obstacle that must resolve their visible goal. But it’s not the end of the story. Transformation. The hero must transform to achieve their outer motivation. In a character arc, this transformation is the point when they go from living in fear to living courageously. This element reveals the story’s theme and reveals universal meaning, which increases emotion and story depth. The visible goal can only be achieved if the character can overcome the state of being stuck. Aftermath. The final element shows the hero living a new life after completing the journey. Hauge gave each of us a bookmark with these elements listed. Stories must be true, but they don’t have to be factual. Audiences don’t want to hear that you became courageous; they want to hear how it happened. Whatever you want your audience to learn and do, you must have the hero of your story learn and do. Stories give your audience a direct experience of whatever it is you want your speech to convey. Freeze your gestures while the audience laughs or applauds. Deliver stories that happened in the past in the past tense. The audience does not see how you feel, only what you project. You are speaking for the audience of your audience. Fripp has launched a Virtual Training website where you can immerse yourself in her speech and sales presentation coaching 24/7. 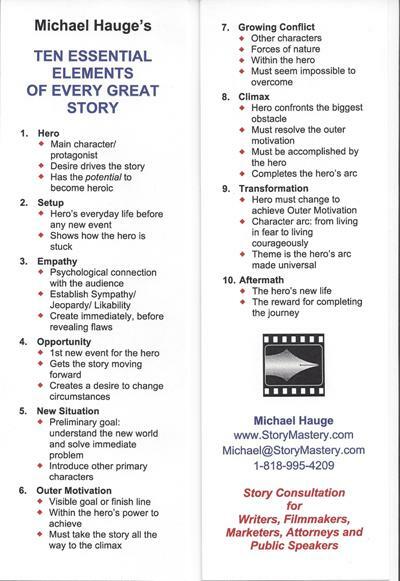 There’s much more from Michael Hauge on YouTube, such as this clip discussing why the audience wants to feel an emotional connection with the character in your stories, even though they are nothing like you.